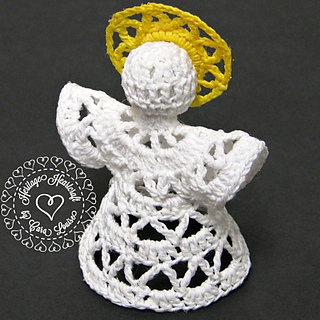 I love to make tiny angels for my mother to hang on her Christmas tree. 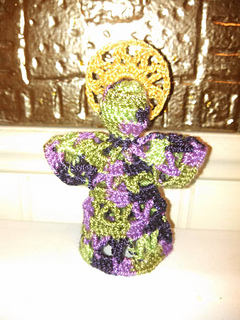 Many of the existing patterns have either been made for her already or just didn’t appeal to me, so I have begun to design new little angels. This is my 2nd published design. The Delta Lace design is made up of regular and inverted v-stitches, which are given a bit of contrast by the solid dc bands. Her sunshine-ray halo could earn her the name Delta Dawn! 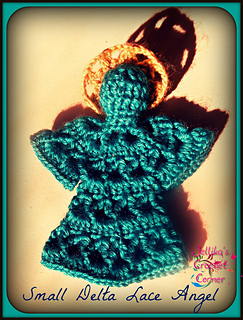 The example and instructions use size 5 crochet thread, but size 3 thread or sport weight yarn would work equally well- just adjust your hook size accordingly.